Eye health is very important to me. Growing up, I always knew that I would one day need glasses because both of my parents and everyone in my family had them. Mom and Dad each got their first pair of classes when they were freshman. At the start of 9th grade, I noticed that I was not seeing the overhead projectors in biology. I told my mother and we set up an appointment to get my eyes checked. Sure enough, I was on my way to my first pair of glasses. When TechyDad and I started our family, we knew that our boys would one day get glasses. I asked him when he got his first pair, and knew it was when he was in second grade. With our oldest now in third grade, I knew things could change for his vision at any time. Over winter break, NHL continued to complain about headaches. Nana asked me one day if we had checked his eyes recently. We had in September when he had his physical, but nothing since. NHL never complained that he could not see in school, but then again he probably did not know the difference. Little things noticed by NHL’s gym teacher, his headaches, and our suspicions made us want to check this out. After break was over, I called the school nurse to see if she could do a quick check. I knew that something was going on because he was not seeing quite right. Nana was definitely onto something and I felt horrible for not putting the pieces together before that. We were lucky that they were screening the entire school for sight and hearing that week. The screener said she would call me immediately since I was concerned about things. The next afternoon, I received a call. NHL’s vision was definitely off according to their quick exam. I quickly called and made an appointment for the early morning weekend day to check when NHL’s eyes were fresh and less likely to be strained. NHL did an amazing job and the place we took him to was fantastic with children. In the end, we found out that he does in fact need glasses and hope this will help to make all of the recent headaches vanish. Tune in tomorrow for a letter to NHL where I share a photo of his new glasses (Harry Potter watch out) and show how a jealous little brother reacts. If you or your children needed glasses, how old were you when you first got them? I didn’t start wearing glasses until I was in my early 20’s. My daughter started wearing glasses around age 11 (she now also uses contacts), my son started wearing glasses around age 11 and actually just started using contacts about a week ago. Stacy Uncorked´s last blog post ..Tu loquere Latine? I don’t wear glasses and so far my kids don’t too..but I do know friends with kids needing glasses as early as Kindergarten. I’ve been wearing glasses since I was 10. There aren’t many of who don’t wear glasses in my family. When I was learning how to walk, my mother got concerned that I was bumping into everything so she took me to see an eye doctor. My daughter wears glasses too. Harriet´s last blog post ..I’m liking Lily and Emma these days. I was 4 when I got my first pair of glasses. I had a lazy eye and had to look at people out of the corner of my eye. Thankfully, my parents caught things early enough and a great doctor at Yale did surgery and I had to patch my eye for a year or two. My husband got them in high school. So I try to keep a close eye on my kids and their vision. Now I’m spooky. It’s very interesting that you would ask this question today and tell your family story. A night ago I had this real to life dream. I dreamed that my son was reading to me and as I was looking at his face, I realize he was squinting and it dawned on me that he needs to see an eye specialist. Both hubs and I wear glasses and have eye problems so I think something is up here. I woke up wondering why he wasn’t still reading to me and then realized it was a dream. I think I should go get him checked. I was about age 9 or 10 when I got glasses. not sure about my son, since he doesnt wear them…. I was 15 and my eldest son was 9 or 10. When I was 25 I had Lasik done and we did that for my daughter on her 18th. I will do it for my son when he is old enough. Totally worth it. @PamelaMKramer – A Renaissance Woman´s last blog post ..Recipe Etiquette – Calling All Food Bloggers! Well I just got told I need them for reading only & I am 32. The Social Frog´s last blog post ..Shop Your Exchange Catalog When Living Overseas! Thanks for your visit yesterday. So far my 5 year old doesn’t need glasses and I only started wearing reading glasses when I was around 47, before that I had better than 20/20 vision. One of the lucky ones I guess. 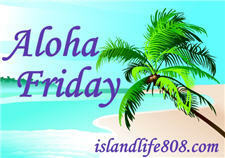 Menopausal New Mom´s last blog post ..Aloha Friday – Discipline Style? My kids do not wear glasses but I got them when I was in my late 20s. I was 10. My son was 5, then he went w/o for a while and started wearing them again in 7th grade. I have worn glasses since I was in Kindergarten, so I have had my kids eyes checked yearly since they were 5 years old. They both wear glasses. Little Bear wears them full time while Indy just needs them for reading. Hers is not a strong prescription, but is totally noticeable in how quickly her reading started to jump once she was wearing them. When LB picked up his he walked outside and said “Wow! Everything is in 3D!” Totally worth the professional exams just in case.